We’ll see how this July daily post thing works. I think I can do it with some ease but when I think about it too much I have my doubts. Considering I did a full 365 back in 2011 you wouldn’t think I would have any problem but, as Mr. Dylan said, things have changed. 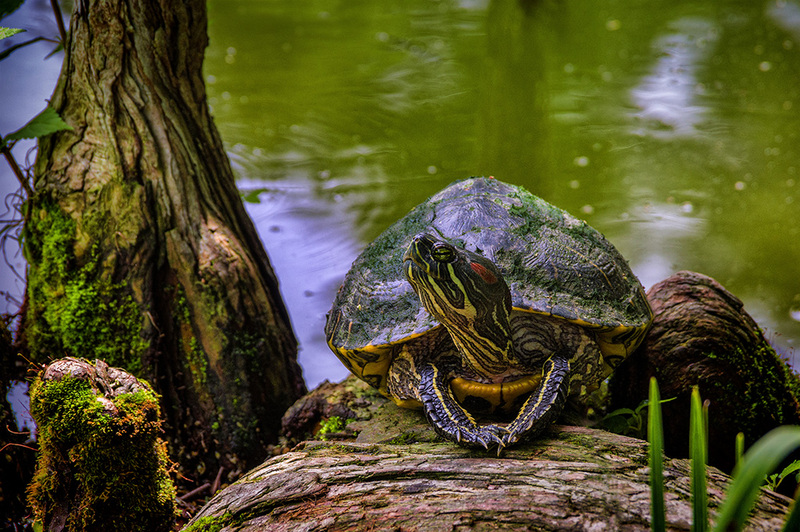 Keeping on a greenish hued theme from Sunday nights photo, I am going with my turtle picture for today. Just chillin’ by the shore. I can’t say I have ever seen a turtle sitting with it’s front legs crossed like that before. Seems awfully relaxed considering there actually was an alligator swimming about 30 feet away. More relaxed than I was! Awesome turtle! I may have to steal…er…borrow (Yeah! That’s it! Borrow…) this one for my desktop background. He struck quite the pose. Makes a fine background – I have it at work!